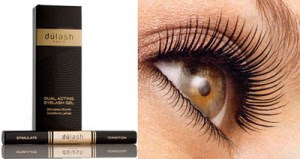 - Dual Acting Eyelash Gel is an innovative eyelash growth stimulating and conditioning system, with a natural gel formula. Use dúlash at the base of your lashes to stimulate growth, and directly on lashes to condition and strengthen even the weakest lashes. Ready to use in one sleek, “dual-brush” container, dúlash - Dual Acting Eyelash Gel is the ultimate solution to longer, thicker, richer lashes in just four weeks. As most of you know, I've tested almost every lash conditioner on the market today, and I feel differently about all of them. I just started Dulash, so I'm not sure of the exact results, however Dulash is different in a few different ways. Dulash is a "dual-brush" system. Other eyelash conditioners only have one side, the "applicator" which you apply to the base of your eyelashes at night. Dulash has an extra brush on the opposite side, meant to condition the entire lash instead of just the base. Once in the morning, and then once before bedtime, and you're on your way to fabulous lashes! Dulash is also different because you can wear this right before your eye makeup. Other conditioners advise you to only apply at night after all your makeup has been taken off and your face has dried. I love this feature of dulash, because it doesn't distract me from my normal day to day beauty routine. I will keep you all updated on my lashes, but for now I really like Dulash. So far I've noticed a bit of length after only a week and a half, so we'll see! One winner will win their own Dulash Eyelash Conditioner! 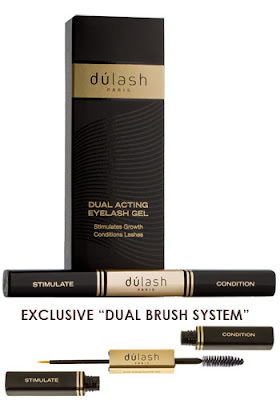 ($95 value) To enter, comment on this post and tell me why you need Dulash!!! Good luck beauties! Giveaway will end 12/6/10. Open to the US only. Winner will have 48 hours to respond to the winning email or another winner will be chosen. No Po Boxes please. i follow with bloglovin' as well! gtc831 at yahoo dot com. I need Dulash because my lashes are so sparse and short! I have a real need for this product-I feel that my eyelashes are almost non-existent. I am sure they are there, I just can't see them. I subscribe to your email news-which I look forward to reading. Good job! I SO need this since my lashes are so sparse to begin with! I would like to have this because I have a hard time finding mascara that I like, and this sounds awesome. I'm sure I would love it. i have the puniest eyelashes in America. I need this more than anyone. Help. My wife needs it for her beautiful eyes! I need DuLash so I can have better eyelashes to frame my face! I need Dulash because my lashes are sparse, light in color and short. my eyelashes need something special. My eye lashes are not that long and no matter what I apply, they just don't "stand out". I am very willing to give this a try. I have very fine & thin lashes and need all the help I can get! My lashes are sparse and crooked. I NEED Dulash because my eye lashes are sparse on top and barely no existent on the bottom! & I truly believe this will help! i need this because my lashes are sparse. I need this because my lashes are short and thin. #1 I "Like" Dulash on Facebook. #2 I "Like" Dulash on Facebook. #2 I follow you on google friends as nightowl. #1 I'm an email subscriber of yours. 2# I'm an email subscriber of yours. I need to win because I am using 3 mascaras at a time to get length, thickness and color. I would love to win because I would love longer, thicker lashes. I need this because my lshes have gotten very thin over the past few years. I need this because I've damaged my eyelashes with too much rubbing of my eyes. I'm trying to regrow healthy lashes. I need this, because one eye has short thick lashes, and the other long and thin. This product might even them out. I need Dulash because the older I get, the thinner my eyelashes get. This would be great. i need this b/c I have sparse , thin lashes! i cut all my eyelashes off when i was a kid, they grew back of course, but nothing like they should have been! i would kill for this. My husband and children have beautiful long eyelashes. I would love to have them too. I need this badly since I've recently lost some lashes on both eyes and the rest are neither long nor thick. I need this because I have totally wimpy eyelashes! I need dulash because nothing seems to works for me. I have subscribed, and liked as well, however I feel the need to have an extra tool to enhance my look and help add an eye popping appearance whether it's during the day or on a night on the town with my ladies or my husband. Keep up on the honest reviews on the beauty products. It's an helpful tool for us researching before trying, thank you. I need this because my lashes are so pale and thin! would love longer, darker lashes! I"ve found as I get older my eye lashes are thinning! I suscribe to you by e-mail. I could definitely use this. My lashes are somewhat thin. Thanks. I have the tiniest, thinnest lashes. It looks like I have NONE without mascara on! 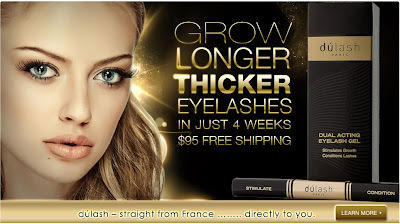 I need Dulash because I've never had nice lashes and there is finally a product for people like me! My lashes are sparse, short and pitiful. Due to a medical condition, my lashes are sparse and thin. I could really use this. i need this because my lashes are short and sparce. i need dulash because my lashes need to be longer and thicker! I need dulash because I have short lashes.